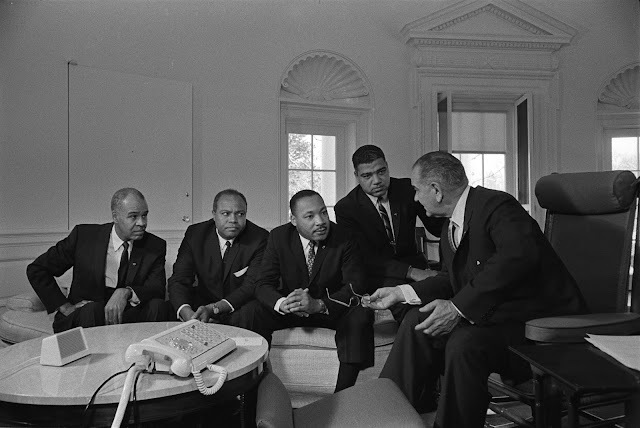 Having lived through the antiwar activism of the late 1960s on college campuses, our views of 36th President Lyndon Baines Johnson have been dominated by his failure to extract America from what was judged a disastrous war in Vietnam. After visiting the LBJ Library and Museum in Austin yesterday and the National Historic Site in Johnson City devoted to his life and Presidency today, our image of him is considerably more well-rounded. 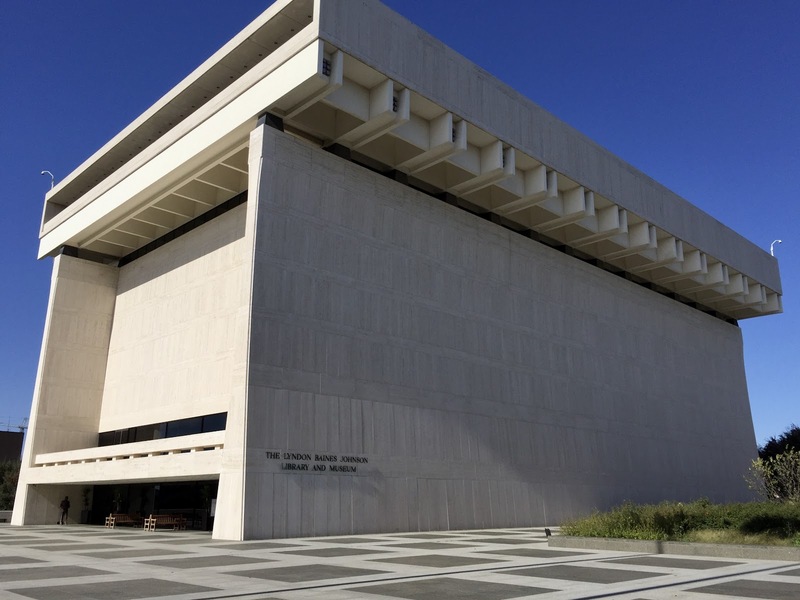 OPENED DURING HIS LIFETIME, THE LBJ LIBRARY AND MUSEUM WAS A SOURCE OF PRIDE FOR LBJ. 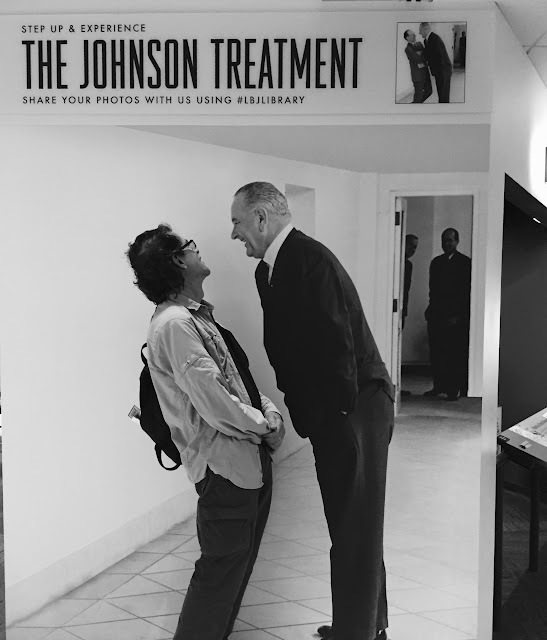 Although it wasn't necessarily our intention when we went to the Presidential Library, we became so interested in his life that we decided to extend our LBJ visit to include his childhood home in Johnson City (60 miles west of Austin) and the family ranch in Stonewall (another 16 miles west of Johnson City). In for a penny; in for a pound, and all that. Posted below are the places we visited in his life order, rather than the order we saw them. LBJ'S GRANDPARENTS BUILT THIS CABIN AT JOHNSON SETTLEMENT IN THE 1860S. 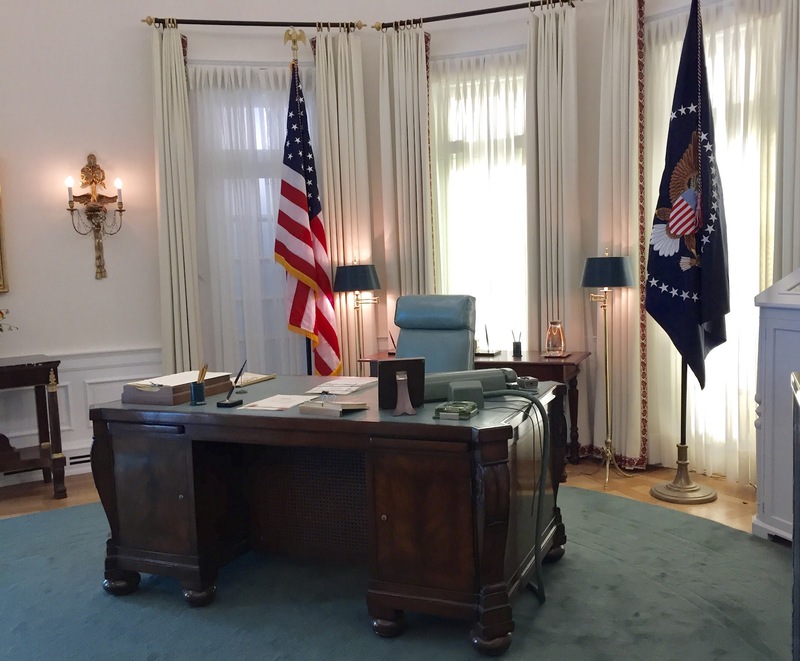 The Lyndon B. Johnson National Historical Park encompasses several properties significant to the former president's life and his administration. One is an area near Johnson City called Johnson Settlement, a collection of buildings constructed by LBJ's grandfather, Samuel Ealy Johnson, Sr., and his brother as a cattle droving headquarters. 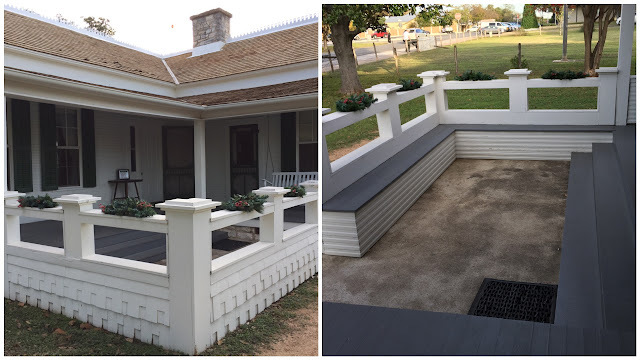 LBJ HAD THIS REPLICA OF HIS BIRTH HOUSE BUILT AS A GUEST HOUSE ON THE RANCH. THE JUNCTION SCHOOL SERVED RURAL INHABITANTS FOR 37 YEARS. By 1912, four-year-old Lyndon was ready to begin his education. His parents sent him to the nearby Junction School, where he joined about 40 other students in a one-room, multi-age class. Boys sat on one side of the classroom, girls on the other. As the youngest pupil, Lyndon often sat in the teacher's lap during reading lessons. When Lyndon was five years old, his family moved to Johnson City. His father was a state legislator, his mother a teacher and journalist. To supplement the family income, Mrs. Johnson took on pupils for tutoring. For this purpose, she had a patio built off the side porch with a wraparound bench where her students could sit during lessons. LBJ lived in this Johnson City house with his parents and siblings—three sisters and a brother—until he graduated from high school. After graduation, Lyndon tried various jobs in Texas and California before deciding to pursue a teaching degree. Even as he followed in his mother's footsteps to become an educator, on campus he was drawn to his father's love also, becoming involved in debate society and a number of political campaigns. 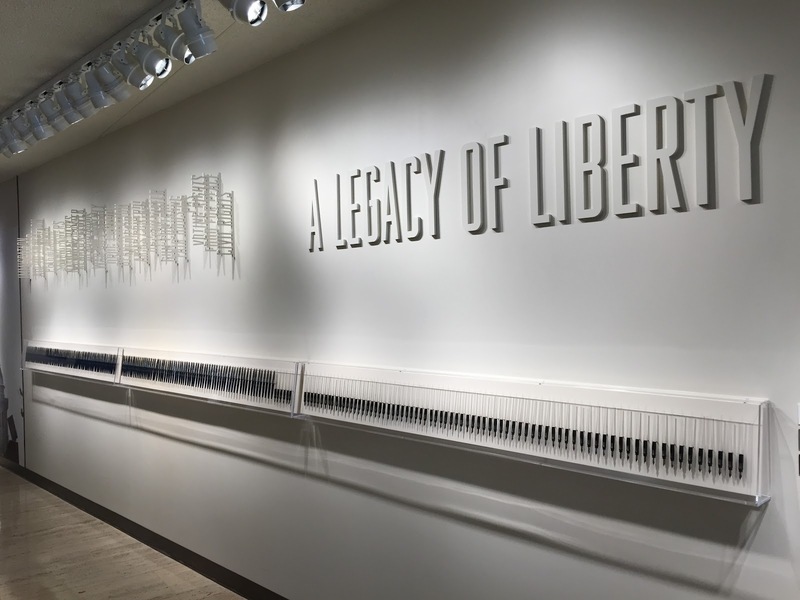 EXHIBITS AT THE LBJ LIBRARY RECOUNT THE TIMELINE OF HIS LIFE, PERSONAL AND PUBLIC. Though he was passionate about education and did spend several years teaching, LBJ had the heart and spirit of a politician. Within a year after he completed college, he went to Washington in 1931 as the legislative secretary to a Texas Congressman. In the nation's capital, he continued to sharpen his political acumen and by 1937, he had won a seat in Congress himself. From there he continued to climb up the political ladder: 12 years as Congressman, 12 in the Senate, Vice-President and then President. AT THE LBJ MUSEUM, PENS USED TO SIGN IMPORTANT LEGISLATION ARE ON DISPLAY. Among the most skillful and persuasive political leaders of his time, LBJ was heavily influenced by his early life and the poverty and limited opportunities he saw in his home state. 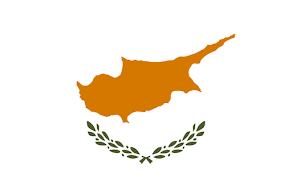 He felt strongly that government could and should protect its citizens and ensure that each and every one have the opportunities to be free from poverty and discrimination. To fulfill this goal, he organized an intensive legislative assault on injustice and inequality. SIGNING LEGISLATION THAT ATTACKED INJUSTICE WAS A SATISFACTION, NOT JUST A CEREMONY. LBJ was intimately involved in the process of guiding his legislative goals through the Congress, meeting daily with aides to chart the progress of dozens of key bills. When special persuasion was needed to reach the required number of votes, he would often employ what aides called the "Johnson Treatment"—aggressive coercion, horse-trading, and sometimes even physical intimidation, not to mention pushing the precise buttons of the individual whose vote he needed. KEN GETS THE JOHNSON TREATMENT AT THE LBJ LIBRARY AND MUSEUM. Lyndon Johnson succeeded in obtaining passage of a massive amount of legislation which still affects the lives of Americans on a daily basis—even almost 50 years after he left office—in the areas of education, health care, consumer protection, transportation, environmental issues, and funding for the arts. Sadly, it is not these domestic accomplishments people remember best about LBJ but rather his part in the management of a war he inherited and apparently had no heart for. Near the end of his life, those closest to LBJ reported that he agonized over his legacy—distraught to think that he would be remembered not as the architect of equal rights and Medicare but as commander-in-chief of the hated Vietnam War. 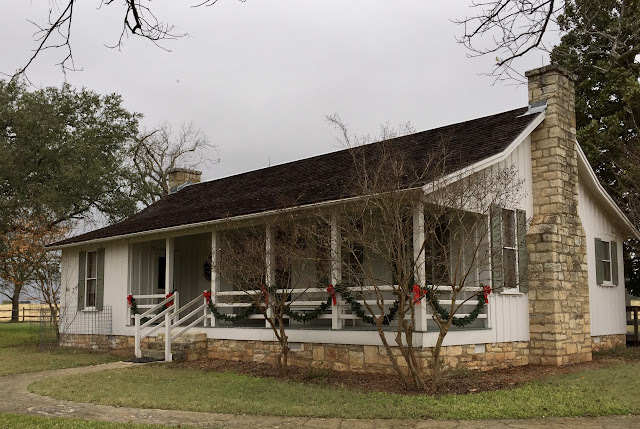 After completing his term of office in 1968, having served five years in the Presidency, LBJ and his beloved wife Lady Bird retired to the LBJ Ranch in Stonewall, Texas. During his years in office, the couple had spent considerable time at what came to be known as the Texas White House because LBJ maintained the same grueling political schedule there as he did in Washington. 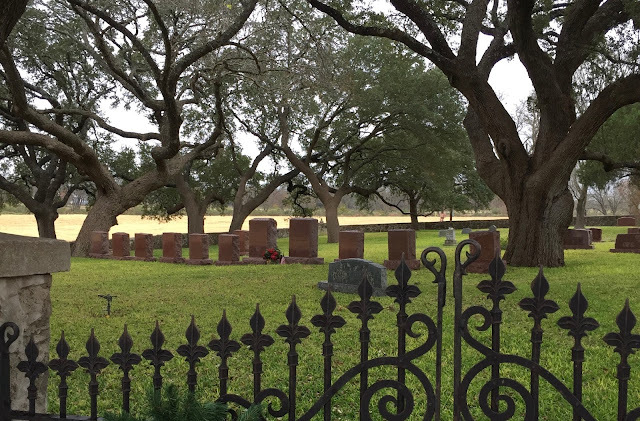 JOHNSON FAMILY CEMETERY ON THE LBJ RANCH. TWO TALLER MARKERS ARE LBJ'S & LADY BIRD'S. LBJ had both a personal and a family history of cardiac problems and died of a massive heart attack at the ranch in January, 1973. 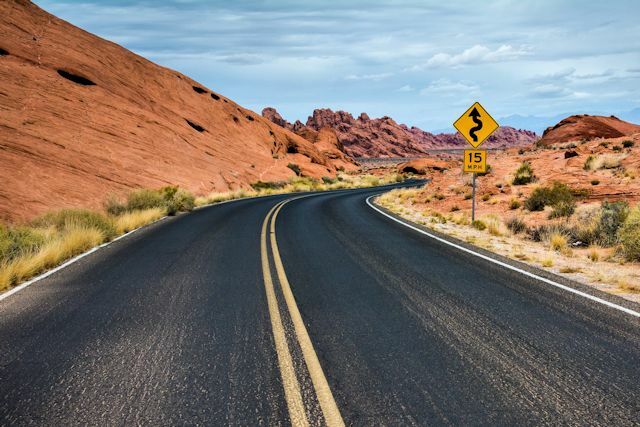 Though he had traveled far and accomplished much, in the end his life had come full circle, and he was buried in the family cemetery, just across the ranch road from the house where he had been born 64 years before. After visiting all the LBJ sites around Stonewall and Johnson City, we drove south on US-281 into San Antonio. Rain had been our constant companion since arriving at Stonewall around mid-day and continued into the evening. With our hotel just a block from the Alamo, we decided to walk over before calling it a day. LIKE SO MANY LEGENDARY PLACES, THE ALAMO SEEMED MUCH SMALLER THAN ONE MIGHT EXPECT. 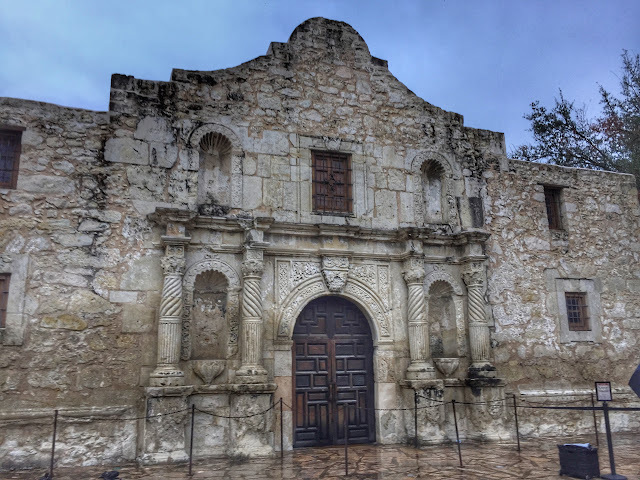 In spite of the rain, the Alamo was teeming with visitors, eager to see what remains of the Spanish Mission of San Antonio that played such an emotional role in the Texas Revolution and the history of the United States. Even today, in memory of the massively outnumbered band of Texans who fought to their death here, the Alamo continues to symbolize a heroic struggle against overwhelming odds. We're planning a couple of 'time out' days in San Antonio before continuing west on our way toward El Paso on Monday. In a land rich in harvest, children just must not go hungry. In a land of great learning and scholars, young people must be taught to read and write. Emancipation will be a proclamation but not a fact. Unfortunately, many Americans live on the outskirts of hope…Our task is to help replace their despair with opportunity. Learned: That one should reassess opinions developed at a formative age like college. On the way from Fredericksburg, where we spent the night last night, to the LBJ Ranch, we passed a sign leading to Luckenbach, Texas. Questioning whether the town really existed or was a figment of Willie's and Waylon's foggy imaginations, we took the right turn to see for ourselves. THE SIGN DIDN'T LOOK LIKE STANDARD ISSUE HIGHWAY DEPARTMENT FARE. Four miles down the road, we learned the truth. The town does exist but it's really a state of mind—and a ramshackle collection of about four buildings. Settled in the mid-19th century by German immigrants, Luckenbach had dwindled almost to ghost town status by the 1960s. 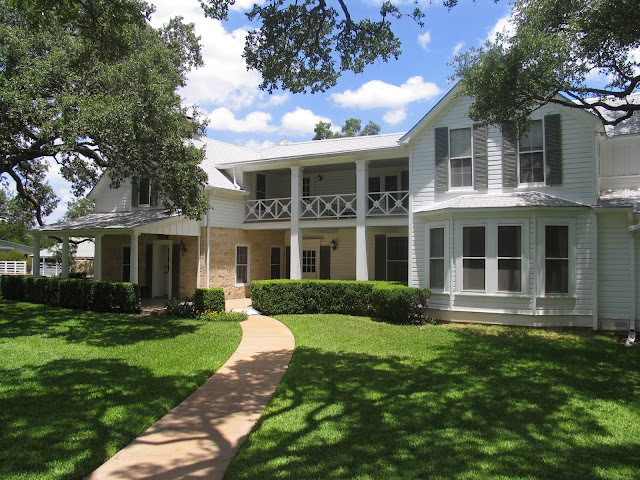 Finally, the ten acres of Luckenbach resting between the South Grape and Snail Creeks was put on the market: "FOR SALE: Town (population 3)." THE 19TH CENTURY GENERAL STORE SELLS SOUVENIRS BUT THE POST OFFICE CLOSED IN 1971. A troubadour and rebel named Hondo Crouch bought Luckenbach in 1970 and declared himself the mayor and "clown prince" of the town. 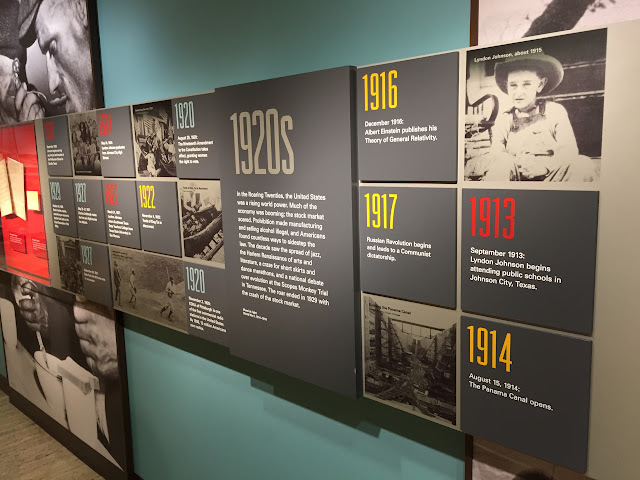 He reinvented the town as a venue for country music concerts and it caught on. Today live music is still offered daily as well as a hearty welcome and a cold beer to anyone who drives up the dusty road into town. 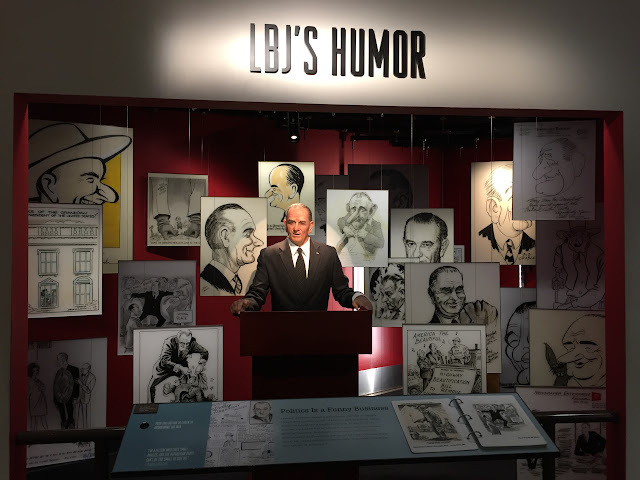 LBJ LIBRARY FEATURES LIFE-SIZE ANIMATRONIC TELLING HUMOROUS STORIES. FOUR FLOORS OF ARCHIVES AT THE LIBRARY HOLD MORE THAN 45 MILLION PAGES OF DOCUMENTS. LIBRARY'S OVAL OFFICE REPLICA HOLDS THE DESK LBJ USED DURING ALL HIS YEARS IN DC. "AIR FORCE ONE-HALF" COULD LAND AT THE RANCH'S SMALL RUNWAY, TAXIING LBJ FROM AUSTIN. EVEN THE VISITOR CENTER AT THE HANGAR INCLUDED EXHIBITS ON LBJ'S PRIZED LEGACY.